Our Team - Direct Insight Services INC.
Gunnar ChristensenGunnar Christensen is the owner and president of Direct Insight Services, Inc. He studied psychology and criminal justice at the University of Nebraska and the University of Texas at Arlington. He has worked in the private sector in the surveillance and security industry for 25 years with an emphasis on surveillance, fraud detection, and behavior analysis. Through the capabilities of advanced digital systems integration and electronic surveillance, his company has deployed internet-based video distribution systems for law enforcement and military robotics applications. Gunnar is a certified K9 handler with training in explosives and narcotics detection and is a licensed investigator in several states. He also is an all-lines Accredited Claims Adjuster and operates in all 50 states and the Caribbean. Jennifer TiptonJennifer Tipton studied business administration at Madison College in Madison, Wisconsin, and at the University of Texas at Arlington. She has 22 years of experience in all areas of private sector investigations with expertise in internet profiling and comprehensive background investigations. Jennifer handles administrative support to the investigative team, investigator scheduling, client relations, and marketing efforts for Direct Insight Services. She is certified as the Qualified Manager for the company’s Texas office, and she is also an all-lines Accredited Claims Adjuster. Jacqueline RistowJacqueline Ristow majored in paralegal studies at Metropolitan Community College in Omaha, Nebraska. She has many years of experience in client relations, team management, and has a passion for the law. 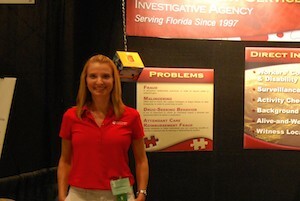 Jacqueline coordinates with administrative support and the investigative team to develop informative reports.